SIR,_Dr Warwick and Dr Warwick ( Nov 4 p 1093 ) are sceptial about the “doktor fish of Kangul “.The species of fish have been identified. There are two types , both being members of the Cyprinidac family adapted to warm miliue 12 -namely , “strikers” (Cyprinion macrostomus macrostomus ) with a terminal mouth and with a terminal mouth and “lickers” (Garra rufa obtusa) with a ventral mouth. (The “jabber” is an immature striker , losing its lateral spots during maturation . )Both fish are omnivorous , a well-known feature of Cyprinidae.The orientation of inadeguate amounts of phytoplankton and zooplanktons caused by high water temperatures . The fish prefer aflected to healthy skin simply because it is easy to nibble at this surface . Some biochemical properties of fish in relation to the high temperature of water have also been investigated. The presence of a high level of selenium (1.3 ppm) in water , topical application of which element is beneficial in some skin dieases ,is an importand factor . The fish may , by softening the psoriatic plague, clear away the scale and expose the lession to water and sunlight. 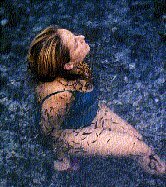 Wide interest in the “ doctor fish “has made people with neurological, rheumatic and skin diseases other than psoriasis visit this hotspring to immerse themselves in its pools. 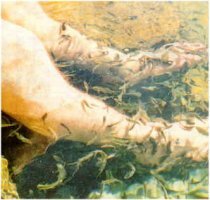 We are grateful for the mention of the doctor fish of Kangal ( Sivas ), Turkey. 1. Timur M, Çolak A, Marufi M.A studyon the systematic identification of the Balikli thermal spring ( Sivas ) fish and the curative effects of the fish on dermal diseases ,Vet Fakült Dergisi (Ankara ) 1983; 30:276-82 . 2. Özer Z, Akpinar MA Akçay M , et al. Investigation of some chemical and biological properties of Kangal ( Sivas ) fishines hotspring .Fen Bilimleri Dergisi ( Sivas ) 1987 ; (suppl 5 ) : 1-34. 3. Halver JE. Fish nutrition . New York :Academic Press , 1972. 4.Akpinar MA,Aksoylar MY . Effects of temperature, dictary fatty acids and starvation on the fatty acid composition of Garra rufa Heckel , 1843. Doğa TU Biyol Dergisi (Ankara) 1988; 12. 1-8.